You have found a property that has the potential to be an easy flip, but it’s in a different state. How can you determine it’s market value? In this line of business, the cardinal rule is that you shouldn’t let anyone else tell you what a property is worth. It’s a great advantage for you to learn how to value every potential property you find. We’ll go over where to find the tools that will help you ultimately determine the market value of the property. The first step in valuation requires comps. Comps are recently sold comparable properties that you can use to determine the potential after-rehab market value of a flip you’re eying. 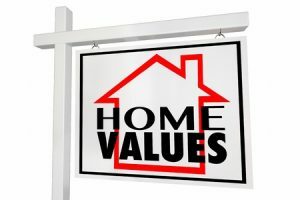 Most residential home appraisals use the comparative-sales approach to determine property values, and this guide does as well. What makes for a good comp? Location, sale date, similar property, and standard sale. We go into more detail about that in this post, but for the purposes of finding good comps, keep those criteria in mind. There’s no getting around it, the best source for the most updated information available on sold, active, and pending properties is the Multiple Listing Service (MLS). This database is often only available through the services of a licensed real estate agent, title company, or appraiser. An excellent real estate agent is worth his or her weight in gold, especially for real estate investors who work remotely. It is worth taking the time to find one that works for your business model and who understands the investor’s unique needs. If you haven’t started interviewing agents yet, start now. It’s important to note that there are hundreds of multiple listing services in the United States. As such, many offer listings only in a small geographical area. This means you will likely need to work with multiple agents should you have houses in different locations. You may have thought about working with a real estate agent, but the idea of giving them a piece of the pie is holding you back. If that’s the case, you might want to consider the points listed above and re-evaluate. Most agents are thrilled to work for investors where they may make less of a commission initially, but receive more repeat business in the long run. More deals, less time spent hunting them down, and a great relationship built on mutual trust is a win-win for everybody. Apart from real estate agents, it may be possible to get comparables from a title company or an appraiser. Often you can provide them with the subject property information and they will return a CMA, or “Comparative Market Analysis.” Those listings must still be approached with due diligence, and you should always do your own analysis on those properties. Ask for all comps, not just the ones they feel are appropriate, and cherry-pick them yourself. Additionally, unlike most realtors who are paid on a purchase of sale of the property, the provider will most likely charge you for the service unless you offer them future business. An agent is invaluable, but what if you’re working on your own or just getting started out? In that case, you’ll have to rely on publicly available data. Government websites, especially the Office of the Assessor representing the subject property’s city or — if unincorporated — county, often have the information you need for free or a small fee. The data that is available to the public through the assessor’s online websites vary wildly from site to site. Some are so sophisticated that they provide GIS mapping of the subject property parcel, or a drawing with interior and exterior dimensions of the house. Others simply note the property’s basic features such as number of beds and baths, square footage, and so on. 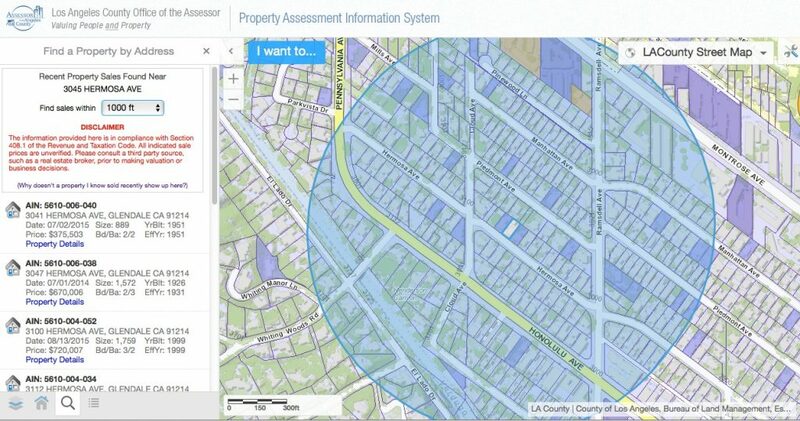 The L.A. County Office of the Assessor website in Los Angeles, California is a great example of a website that provides plenty of information on a property for free. Below is such an example, showing sales within the last two years, and a parcel map. Armed with simply an address, or preferably, the parcel ID, there is a wealth of information available from government websites that is worth any small fee associated with it. On the other hand, a government website is only as up to date as the office that receives the information. Sometimes there may be months between the time a sale is complete and the deed is recorded at the appropriate government office with the final sales price listed on the website. The frequency at which the data is updated varies from site to site. The website’s FAQ section may clarify when exactly the updates do or will occur. Government websites are great starting points for getting an idea of a property’s worth, but keep in mind their limitations. In the same vein, often when you look at public records comps you will see different recording indications. Sometimes the sale price you see is the actual sales price recorded by the city or county — the property’s Fair Market Value (FMV) — or the price will be the Assessed Value. These two values are often used interchangeably in relaxed conversation, but they are actually derived from different sources and used in different ways. It’s easy to get the concepts confused, so it’s important to know how they are used in relation to the comps you are looking at. The Assessed Value of a property is established by local governments (often the Assessor’s Office) to determine the property owner’s annual tax. The assessed value is typically 80 to 90 percent of the FMV of the property, although that percentage varies from state to state, and the annual tax rate, usually 1-2%, is multiplied by the assessed value to arrive at the annual tax amount. Assessments do not occur on a frequent basis so it’s entirely possible that the value you find may not reflect the current value. Assessed value is not a value you should rely on for your comps. Ideally you would have the Fair Market Value of the property as the sold comparable price. The term and definition of Fair Market Value has been established by the IRS as the price a property would sell for in an open and competitive market, between unrelated parties, given that both parties know all the facts of the transaction, and that neither the seller nor the buyer is coerced or the seller unduly motivated. That’s why it’s important to know whether the sale was a short sale, or performed by a desperate seller, as these values usually fall short of an accurate FMV. Comps you receive from a real estate agent will often note what type of sale was transacted. Where the previously mentioned methods are not available or are out of reach, free online aggregators can help fill in the blanks on property data. For example, often there is no way to retrieve the most recent information about sold properties on a government website, either due to updating constraints or the fact that the data is not provided. Also, comps requested from a real estate agent are dependent on the agent’s expertise and may not always be a complete list. In many cases, sites such as Zillow.com will allow you to input the subject property address and then select filters to include only properties that sold within the last x number of months. You can then use this list to narrow down your comps, but be cautious when working with the provided numbers as the data used to create them may not always be complete, or recent. Aggregators generally get their information from county records and public sources that are often updated infrequently. In addition, some states may be prohibited from releasing sales information and data is sparse in those areas. * As such, the automated valuation methods that they use depend on incomplete data which makes it impossible for them to be capable of determining current value. Thus, the Zillow.com Zestimate should never be relied on as an accurate measure of ARV, and that applies to aggregators in general. The MLS is considered the gold standard in getting the most up-to-date and complete picture of market activity, as most sales are performed and recorded there immediately. However, you may not have access to the MLS, and in those cases, you may need to use a combination of the outlined sources based on their completeness and availability in your market. Do you have any tips or insight on where to find comparables that has worked for you? Please share below in the comments. There are some states — Alaska, Idaho, Indiana, Kansas, Maine, Mississippi, Missouri, Montana, New Mexico, North Dakota, South Dakota, Texas, Utah, and Wyoming — that either have laws forbidding the release of sales information to third parties that are not central to a transaction, or that take no stance, making disclosure a voluntary act of the seller. Inaccurate data is highly likely to be found on all aggregators, and government websites may expressly state that they do not provide sales data. In these states, it is possible that your only option is to find a licensed real estate agent that has access to the MLS. This list is not exhaustive, and state law is constantly shifting, so it’s a good idea to contact your assessor’s office or check the state’s official website to determine if you live in a non-disclosure state or not.